The average concentration of carbon dioxide in Earth’s atmosphere topped 411 parts per million in May. In April – the previous month – the concentration hit 410 ppm for the first time in recorded history. These are the highest CO2 levels in the 800,000 years for which we have good data. This is expected to have a catastrophic effect on human health and the planet. We have a pretty good idea of what Earth’s atmosphere has looked like for the past 800,000 years. Humans like us – Homo sapiens – evolved about 200,000 years ago, but ice-core records reveal intricate details of our planet’s history from long before humans existed. By drilling more than 3 kilometers deep into the ice sheets over Greenland and Antarctica, scientists can see how temperature and atmospheric carbon-dioxide levels have changed. From that record, we know the atmosphere and the air that we breathe has never had as much carbon dioxide in it as it does today. For the first time in recorded history, the average monthly level of CO2 in the atmosphere exceeded 410 parts per million in April, according to observations at the Mauna Loa Observatory in Hawaii. In May, that number climbed above 411 ppm, according to researchers from Scripps Institute of Oceanography at the University of California San Diego and the National Oceanic and Atmospheric Administration. The record is not a coincidence – humans have rapidly transformed the air we breathe by pumping CO2 into it over the past two centuries. In recent years, we’ve pushed those gas levels into uncharted territory. That change has inevitable and scary consequences. Research indicates that if unchecked, increased CO2 levels could cause pollution-related deaths to increase by tens of thousands, and lead to the slowing of human cognition (especially when you take into account the fact that CO2 levels tend to be higher indoors in cities). Carbon dioxide also contributes to warming that causes sea-level rise, searing heat waves, and superstorms. “As a scientist, what concerns me the most is what this continued rise actually means: that we are continuing full speed ahead with an unprecedented experiment with our planet, the only home we have,” Katharine Hayhoe, a climate scientist, said on Twitter. 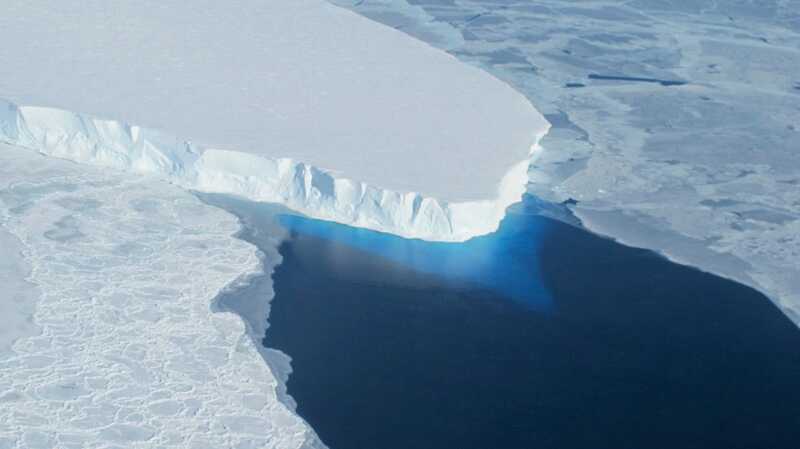 NASAVast glaciers in West Antarctica seem to be locked in an irreversible thaw linked to global warming that may push up sea levels for centuries. 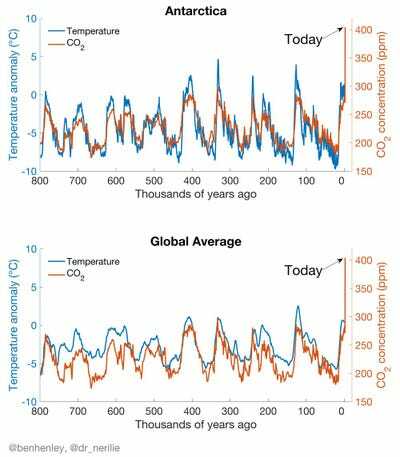 For the 800,000 years for which we have records, average global CO2 levels fluctuated between about 170 ppm and 280 ppm. Once humans started to burn fossil fuels in the industrial era, things changed rapidly. Only in the industrial era has the number risen above 300 ppm. The concentration first crept above 400 ppm in 2013, and it continues to climb. There’s a debate among scientists about the last time CO2 levels were this high. It might have been during the Pliocene era, 2 million to 4.6 million years ago, when sea levels were 60 to 80 feet higher than today. Or it may have been in the Miocene, 10 million to 14 million years ago, when seas were more than 100 feet higher than now. 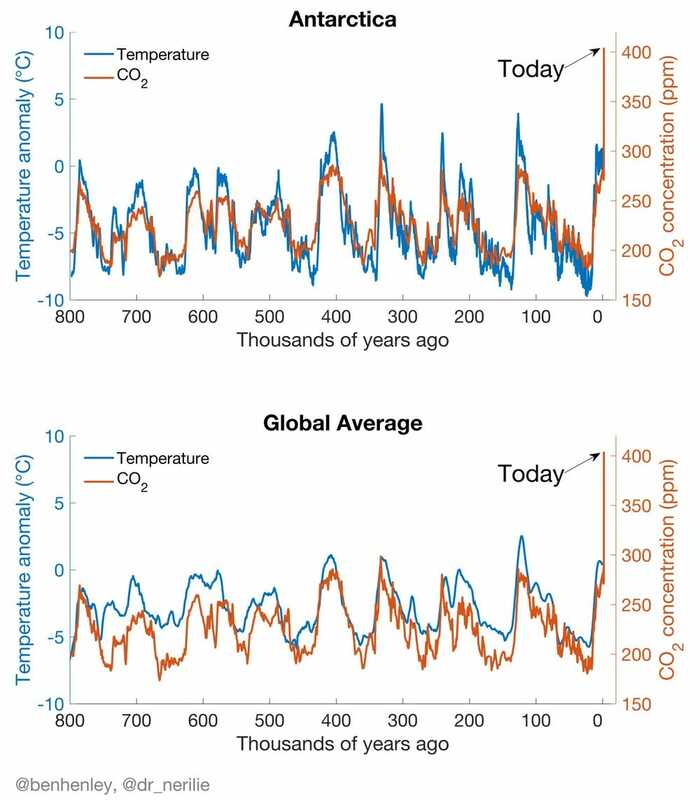 In our 800,000-year record, it took about 1,000 years for CO2 levels to increase by 35 ppm. We’re currently averaging an increase of more than 2 ppm a year, meaning we could hit an average of 500 ppm within the next 45 years. CO2 doesn’t directly harm human health at these concentrations. But because it traps heat on the planet that then cranks up the global thermostat, it can have a very significant effect on health. Higher levels of CO2 and the warming they cause also exacerbate ozone pollution. One 2008 study found that for every degree Celsius the temperature rises because of CO2 levels, ozone pollution can be expected to kill an additional 22,000 people via respiratory illness, asthma, and emphysema. Humans have never had to breathe air that’s this polluted. Increased air pollution has been shown to cause lung cancer, cardiovascular disease, and higher rates of allergies and asthma. 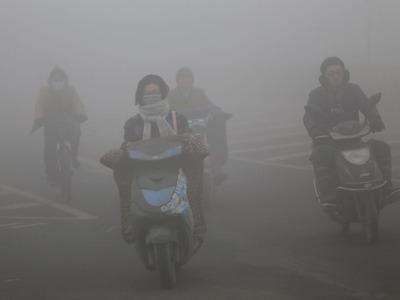 A recent study found that 9 million people died prematurely from pollution-related diseases in 2015, accounting for 16% of all deaths worldwide. Other research has raised even more concerns. The average CO2 level doesn’t represent the air most of us breathe. Cities tend to have far more CO2 than average – and those levels rise even higher indoors. Some research indicates that it may have a negative effect on human cognition and decision-making. For these reasons, President Barack Obama’s EPA ruled in 2009 that CO2 was a pollutant that needed to be regulated under the Clean Air Act. But the Trump administration is reevaluating that ruling. The human-health effects of CO2 increases are just one part of the bigger story here. The change we’ve seen in CO2 levels recently has been much more rapid than the historical trends. Some experts think we’re on track to hit 550 ppm by the end of the century, which could cause average global temperatures to rise by 6 degrees Celsius. For context, the increase in superstorms, rising sea levels, and spreading tick-borne disease that we’re already seeing comes after a 0.9-degree rise. Ben Henley and Nerilie Abram/The ConversationData from Parrenin et al., 2013; Snyder et al., 2016; Bereiter et al., 2015. Projections of sea-level rise will also get more extreme as CO2 levels continue to climb. Right now, carbon-dioxide emissions are still rising. The goal set in the Paris agreement on climate change is to limit the global temperature increase to 2 degrees Celsius or less. But as a recent feature in the journal Nature revealed, we’re on track for more than 3 degrees of warming. The latest measurements show that if we want to avoid that dangerous scenario, we need to make dramatic changes very quickly. This story was updated on June 12 to include the newly released data on CO2 levels hitting a new record in May and to clarify the means through which higher levels of CO2 affect human health.